If British Rail can't manage to get its trains running on time, how did it ever think it would be able to master space travel? That didn't dull its aspirations back in the 1970s however when it patented a plan for a flying saucer. 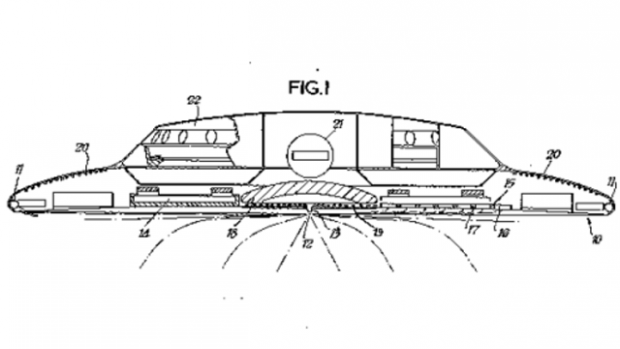 Designed by Charles Osmond Frederick (with the patent granted in March 1973), the patent describes a craft that uses nuclear fusion for its energy source, with laser beams generated in pulses to stabilise the vehicle. Magnetised subatomic particles would provide lift and thrust, with a thick metal shield in the hull protecting passengers from radiation. Its grasp of physics is, clearly, batshit crazy, and with the likelihood of the craft ever getting made being slim, the patent lapsed in 1976. But as YouTube star Tom Scott points out, even the most insane ideas, if original enough, can be worth patenting.